Pennsylvania Rep. Mark Rozzi's shameless grandstanding may finally have caught up with him. Under the guise of protecting children, Rozzi has spent the last several years targeting the Catholic Church—exclusively—while giving a pass to virtually all other institutions beset by predatory adults abusing minors. Chief among his efforts has been trying to pass legislation that would allow individuals and organizations to be sued retroactively—going back not just years, but decades—for allegations of abuse that are almost impossible to adjudicate. Now, support for that legislation is waning. Rozzi has acknowledged that the Speaker of the Pennsylvania House, who supported his bill in the past, has told him he no longer supports it. This is welcome news. Rozzi's original bill did nothing to eliminate the sovereign immunity that protects public entities from such lawsuits. This is a particularly egregious omission in Pennsylvania, which in recent years has been identified as having one of the worst records in the nation when it comes to public school personnel sexually abusing students. But that was never Rozzi's concern. He proved that in 2016 when he called for using taxpayer money to investigate every Catholic diocese in the state for sexual abuse crimes. He did not want to target any other institutions, public or private—including those notorious Pennsylvania public schools. The next year, in a memorandum on his abuse legislation, Rozzi acknowledged that he had "heard heartfelt pleas from grown men and women whose lives had been destroyed by ministers of every denomination, scout leaders, public and private school teachers, coaches, missionaries, and worst of all, family members." Did this mean he was through exclusively targeting the Catholic Church? No! In the very next sentence, he hailed the Pennsylvania Attorney General's "first in the nation, state-wide grand jury investigation of all eight Roman Catholic dioceses." Not a word about the need to investigate all those other entities—again, including the public schools—that Rozzi had just acknowledged were responsible for destroyed lives at the hands of sexual predators. Recently, the Pennsylvania Supreme Court issued a stay blocking release of that grand jury's report on six Catholic dioceses—and Rozzi is fulminating. He called it "a punch in the gut." He accused the Church of "spend(ing) millions to silence victims," and of "kick(ing) us to the curb like trash"—even though he knows that all six dioceses supported the release of the grand jury report. As the Supreme Court made clear, its release was challenged by "many" individuals who, while named in the report, were never allowed to appear before the grand jury. The Court believes this raises some legitimate due process concerns. Rozzi, of course, shows little concern for due process rights—whether for people named but not charged in the grand jury report, or for those he wants to subject to lawsuits for decades-old allegations. Rozzi's goal was clearly to have the grand jury report released before the legislature adjourned at the end of June—so he could use it to ram through his retroactive bill. With that bill now losing momentum, perhaps Pennsylvania will enact much fairer legislation passed by the Senate but blocked by Rozzi. 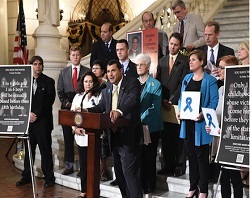 That bill would greatly extend the statute of limitations going forward, for all entities, public as well as private. Its passage will enable the protection of all children, while also respecting the due process necessary for distinguishing the innocent from the guilty.